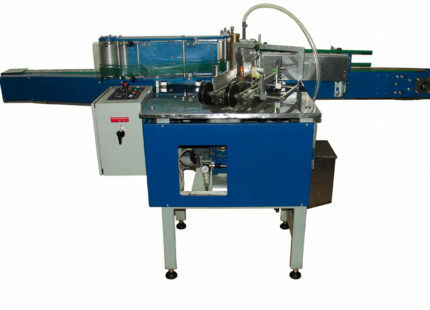 The machine can operate as part of a line or as a single unit, because it has its own conveyor and does not require a special foundation for installation. 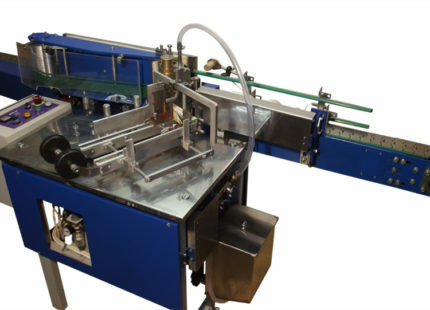 The design of the machine allows for gluing both conventional and circular labels by applying a thin layer of glue on the label itself. Most of the operated linear labeling machines used in the CIS for glass and PET are made in Poland, their copies are made in the CIS. П1-ВЭН in comparison with the above-mentioned machines has several positive differences. The kinematics of the machine basically consists of gear and cardan boxes in comparison with chain gears. the store’s structure allows to use labels of complicated form. The body of the conveyor is made of stainless steel. It is used when the product contains vinegar or other acids and aggressive substances. The body of the conveyor is made of common steel with a polymer coating – when the product does not contain aggressive substances. An additional auger for changing over to a different tank size . It is necessary if there is a sufficiently large difference in the dimensions of the container. Particularly necessary for unstable containers – PET or high-grade glass containers with a small diameter (bottles). Wide conveyor. Conveyors with a width of 82 mm are standard made. When labeling containers with a diameter of more than 120 mm, a conveyor with a band width of 114 mm is installed.